My step son always raved about the Potato Pie (the youngins these days don't call it a Shepherds Pie anymore... Shepherds mustn't be cool or something!) and since going Low Carb, High Fat it seemed this dish was a no no.... but NO! I made this dish recently and it was fantastic! 1. Put the almond flour and butter in a mixing bowl and mix well. 2. Add in the eggs and salt and continue to mix. 3. Get a couple of sheets of grease-proof paper and lay it on the bench making a nice big surface area. 4. Put the dough ball from the mixed onto the grease-proof paper. 5. Using a rolling pin, roll the dough out so its around 3-4mm thick. 6. Grease your pie dish with butter. 7. Losen the rolled out crust from the grease-proof paper by picking up the paper, turning it over and losening it gently. 8. Line the pie dish with your crust and gently push it into place. NOTE: Be careful as this crust isn't stretchy like regular pastry crusts. 1. Fry up the onions, zucchini and celery in butter then add in the mince and cook until browned. 2. Once browned, turn to a low heat and add in the stock, parsley, tomatoes and the tomato paste and let simmer until cooked and a thick consistency. 3. If the dish is too runny, keep it on a low heat (no lid) so it reduces down nice and thick. 4. 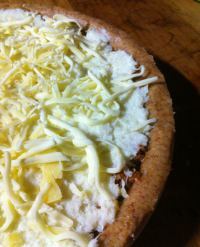 Pour the filling into the crust covered pie dish but leave about 1-2cm from the top of the dish for the pie-top. 2. Put the soft cauliflower into a separate saucepan and mash. Add small amounts of the cream until its a nice creamy mash texture. 3. Add in the grated parmesan cheese (as much as to your liking) and mash until mixed. 4. Spread out the mash mixture over top of the pie evenly. The trickiest part of the crust is getting it off the grease-proof paper, and into the pie-dish. It took me a few goes, a few breakages, and a few re-rolls before I worked out my knack, and you'll work out which is the best way for you by practice. 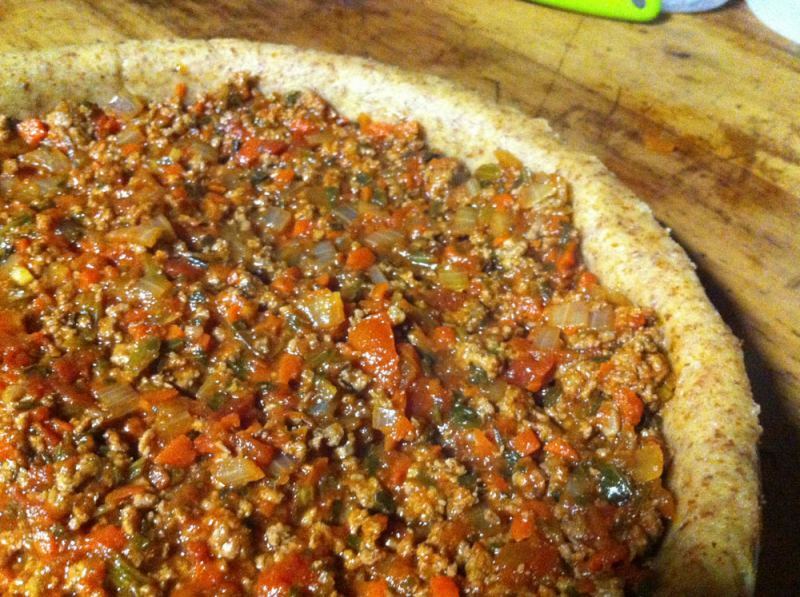 You can substitute, or add anything you like to this as its a pretty standard tomato mince dish. Add some cajun spices or even some chilli for some ZING, or slice up some eggplant to add into the mix. The same as you do with mashed potato, use a fork to tell whether the cauliflower is soft enough to mash. Mashing partly cooked cauli is a nightmare. And make sure you mash by hand. Using a food processor like a Bamix tends to take all the air and fluffyness out of it. 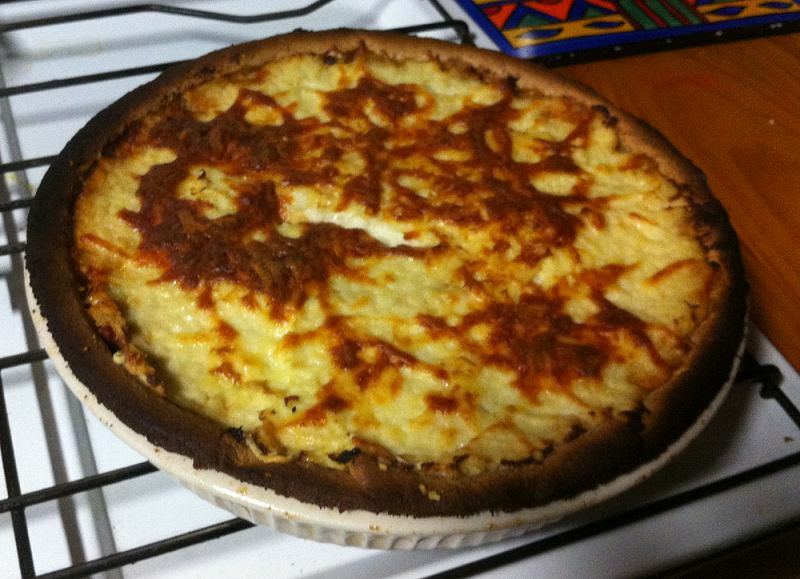 The photos are of my first attempt and as you can see its a little overcooked. Keep an eye on it and remove from the oven when you see the crust starting to brown.